The new 3.5-t TB/TBR-STEIGER® models in the brand new “Hi-light Performance” range reveal RUTHMANNs plan to further strengthen and expand its national and international market-leading position in the 3.5-t category. Through state-of-the-art engineering, the German access-platform manufacturer offers customers an array of technical advantages for a wide variety of individual requirements. RUTHMANNs five STEIGER® models in the 3.5-t category include: the TB 300, TB 290 pro and TB 270 pro as well as the TBR 260 and TBR 230 in the TBR series – an amazing range of Hi-lights. The new RUTHMANN STEIGER® TB 300 sets a new world record with unprecedented 30 m to 3.5 t. A sensation on the truck-mounted aerial working platform market, stable and powerful, 30 full meters working height with a full 250 kg basket load. As is so often the case, the incentive for the newly-designed models came straight from the market. Improvement initiatives from RUTHMANNSERVICE also played an important role during the design and development process. When it comes to analyzing the most powerful truck-mounted access platforms, there are many deciding factors that must be considered. Different design concepts produce different performance capabilities. This also holds true for the new Hi-light Performance“ range – the company’s so-called “bread and butter machines.” RUTHMANN has created a new logo for this series. Hi-light stands for enormous performance capabilities in the lighter 3.5-t category. Compared to the previous series, the new Hi-light Performance range has maximized performance capacity, increased basket-load (to 250 kg), faster movements, and enhanced stability. In fact, the performance capabilities featured in this new series are simply unprecedented. The TB 270 pro has broken through the 18-m reach barrier for the very first time. That is a full 1.7 m more than on the previous model – the TB 270. 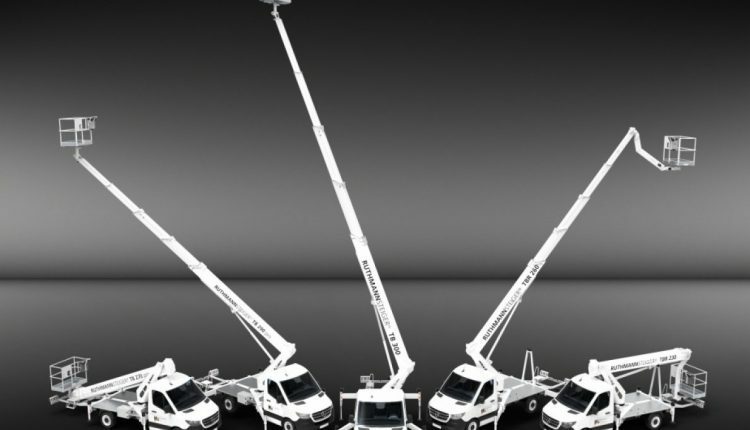 At 90 °, operators even have 2.8 m of additional reach capacity. The TB 300 is the literal highlight of the new series. A bona-fide 30-metre working height can now be achieved on a 3.5-t chassis – a major advantage in this height category. RUTHMANN strives to optimize handling, safety, and overall efficiency at the job site. For example, Nico Wessels – Head of Product Design – repositioned the telescopic cylinder inside the telescopic boom system in order to protect it from damage and/or unfavorable weather conditions. This also ensures smoother extension and retraction of the boom system. Optimum operation is also supported by the newly-developed boom profile. Made from a single sheet of high-strength, fine-grained, steel, the boom sections are laser cut, folded/beveled, and then welded (single seam) using the innovative laser-beam welding (LBW) technique. Due to lower heat development, this fabrication process results in significantly less warpage and an almost invisible weld seam. The proportional control system allows lifting, swiveling, telescoping, jib movements, and work-basket rotation to be carried out at the same time. In the large-scale category, multiple movements have been a state-of-the-art feature for years. This ultra-convenient and highly-efficient system is now also being expanded to other models. “STEIGER® operators in the lighter 3.5-t category will no longer have to do without the features found on larger models,” says Dr. Eng. Nico Krekeler, RUTHMANN’s Product Design and Development Manager. “Models in the new Hi-light range are equipped with a new hydraulic control block with additional proportional valves.” This means that STEIGER® operators in the 3.5-t category will be able to complete their assignments faster and more effectively than ever before. The four outriggers can now be controlled from each side as well as from the control panel in the work basket and secondary controls. In addition – and this is new for RUTHMANNSTEIGER® models in this category – the outriggers can also be activated from the new support control mechanism on the vehicle. This simplifies and speeds up the stabilizing procedure and positioning of the outrigger pads. Using the convenient LED color scheme, the operator can immediately determine whether the outriggers are extended and stabilized properly (green light) or if further adjustments must be made (red light). The list of the newly-designed technical features is endless. The new base frame has a much higher torsional rigidity. The turret is multi-beveled, additionally reinforced, and (at 90°) never rotates/protrudes beyond the width of the vehicle. The new proximity switches/sensors on the outriggers, facilitate safer positioning in all types of weather conditions. The underride guard Is lightweight, yet sturdy. With it, STEIGER® models in the Hi-light range can be licensed and driven anywhere in Europe. RUTHMANN continuously strives to maximize safety, efficiency, and convenience at the job site. The newly-designed work basket features a generous 250-kg basket-load capacity at maximum performance capacity. The basket rotates with an electro-hydraulic worm-gear drive mechanism. The work basket also features the company’s own perforated, non-slip floor for enhanced operational safety. Building façade cleaners will benefit the most from the new slip-resistant floor. The struts on the basket have been reduced and there less obstacles/stumbling hazards. The railings are no longer cone-shaped. This gives operators more space in the basket although the dimensions remain the same. The new worm-gear drive mechanism for the basket rotation maximizes stability and provides a greater sense of security. The reduced play is particularly noticeable when working 30 m off the ground. Other optional extras include adjustable spotlights, light ground-protecting outrigger pads, display in the work basket, storage containers, marker lights, etc. Mercedes Sprinter and Iveco Daily chassis are available for the 3.5-t category. Other customer requirements (all-wheel drive and/or higher payload capacity) are optionally available on heavier chassis. With chassis such as the STEIGER® HV5 or S7, RUTHMANN focuses on other target groups for whom the Class B driver’s license is not such an important issue. With high payload reserves for tools and materials, with off-road capability for assignments in rough and uneven terrain, RUTHMANN focuses primarily on customers who are active in the construction, municipal, and electric-utility sectors. In all of its new developments, RUTHMANN recognizes the advantage of incorporating identical/similar components into the design process. All models in the TB and TBR series are based upon the time-tested modular-design concept – utilizing as many identical parts as possible. This offers customers and operators significant advantages when it comes to orientation, handling, maintenance, repair, and parts availability.